Franklin Woman's Club members continued the tradition of donating and packaging festive bags of candy to brighten the holidays of residents at local facilities providing care for the elderly. On Friday, November 24, Marilyn Andrews,(Home Life/Social Services Chairman) delivered a total of 100 candy bags split between Willow Creek Rehabilitation and Care Center and Spring Hill Assisted Living, both in Somerset. Pictured above left: Franklin Woman's Club Members Marilyn Andrews (left) and Mary Ann Savino package and decorate candy bags. 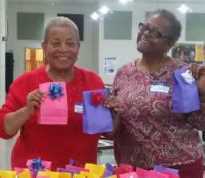 Pictured above right: Marilyn Andrews (left) and Sandi Cox display the completed bags. So sweet! !